Far in the future, a dangerous high-speed racing sport was invented to appease wealthy space traders. 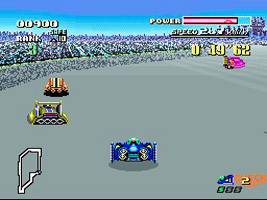 Set on tracks suspended high above the ground, The F-Zero Grand Prix quickly became extremely popular, attracting thrill-seeking competitors from across the galaxy. There are four racers to choose from. Complete five laps on each track, finishing each lap with a certain rank. If you fall behind, your car takes too much damage or falls from the track then you are disqualified. Regain energy by running over the pink Power strip. The Grand Prix mode has four cups and three difficulty levels. Practice each circuit or aim for the best times in Practice Mode.